Tate Modern in London hosts (from 26 September 2008 to 1 February 2009) an exquisite exhibition of the late work of Mark Rothko – Rothko – The Late Series. It focuses on his series beginning from 1950s famous ‘Seagram Murals’, then his formidable ‘Blacks’, ‘Brown and Greys’ and ‘Black and Greys’ – the last paintings he produced before his death at the beginning of 1970. All the works presented are the artist’s most mature, most representative works (with an exception of the original paintings for the ‘Rothko’s Chapel’, which couldn’t be borrowed). They paint a picture of a formidable artist – a mystical, philosophical figure, as tragic as courageous he seemed to be in his spiritual and purely artistic endeavours. Right at the start we have to face the famous ‘Seagram Murals’, which are in a lucky possession of the Tate Gallery, but now have been reunited for the first time with the other works from the series from Japan and America. The Murals have a fairy-tale of their own… originally commissioned to a luxury “Four Seasons” restaurant in the Seagram Building, New York, they have been meant by the artist to be a sort of ‘artistic explosives’ – planted there to disturb. Rothko was quoted saying, that all he wanted was to make the rich customers of that posh environment to feel very uncomfortable at their lavishly set tables. Hence, instead of six required he painted over thirty huge abstract, windows-like oils – then he spent some time making careful plans, which ones and in which arrangement will make their trick of making those nasty ‘sons of b….’ feel trapped and choking in their presence. Then, from various reasons known (and unknown) he abandoned the commission; eight canvases from the series has been donated to Tate Gallery by the painter himself – they compose so-called “Rothko Room” which is available for viewing at a permanent basis. The same, if not more is true with the “Black” series – these middle-sized (as for Rothko) oils present the view of your own closed eyes, which would remain completely and uniformly black as long as you are closed for your inner worlds. “Space” would the key word here – spiritual space, which is supposed to command the actual, physical space it occupies through an artwork. Perhaps it’s in this series that one can appreciate the artist’s technique at its best – having UV light in our eye we would be able to see why, at the first sight – ‘just black’ surfaces seem to be animated and reflecting rather, than devouring light. 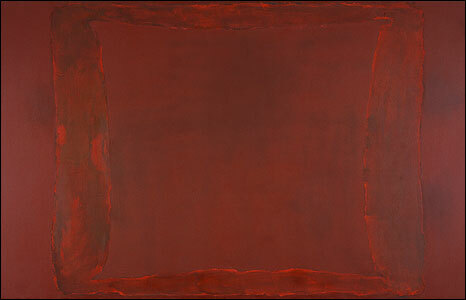 Scarcely visible shifts of tones and brushwork, intelligent playing with opaque/glossy and thinner/thicker, feathery building up layers upon layers and the perfect control over the media used – the same applicable for each painting on the exhibition – that makes Rothko’s work almost absolutely reproduction and imitation-proof and even more impressive. His ‘Black-Grey’ series should be noted from these two reasons alone – they’ve been painted shortly before the painter took his life, and they seem to be a first step in a new direction (which, sadly, was never to be continued); the brush strokes here are much more visible, impatient and expressive; striking device of a frame-like white strip traps the visions attempted poignantly within the pictorial space. What else?… Many words have been thrown at Rothko’s work, both ignorant, criticizing and acclaiming – yet, what I think should be stressed always, is the highly personal character of a reception – no one can think that he ‘knows’ what ‘Rothko is all about’ unless making his very own way to and deep into this remarkable artist’s work. It’s more like a participation in a self-provoked and mastered performance – it just has to take place to make sense, and perhaps – only sense for your only, unique case. Click on a link to see the details of the exhibition. Tony O’Malley (1913-2003) – Irish painter. Self-taught. Bank clerk for 24 years he starts to paint being in his 40s, he retires from his original profession due to poor health. In 1960 he leaves “suffocating” (in his own words) Ireland for Cornwall, St.Ives and remains an artist ‘in exile’ for the next 30 years. Being in his 60s he marries a picturesque lady – a Canadian artist, and starts to enjoy the first, though still shy signs of the deserved recognition. He develops a habit of revisiting Ireland (especially his father’s birthplace – Clare Island, off the shore of Co. Mayo) and exotic Bahamas (with the wife – Jane Harris). He returns to Ireland in 1990 to become a quiet resident of a cottage in a place he would call the ‘place of the fairies’ – Physicianstown, near his birthplace in Callan, Co. Kilkenny. By this time dealers and art critics would queue to hear his story becoming more or less aware that in this private, modest ‘newcomer’, st ill quite unknown, one could recognize an artist of, at least, all-national importance. Prestigious awards and shows follow one after another, so within the last years of his long life Tony O’ Malley enjoys the reputation of the most beloved, fauvorite painter of Irish people. And it seems to be as well-established, if not stronger now, a bit over five years after his death. This story of an artistic Cinderella and a Prodigal Son at the same time captures one’s attention apart from his art, but-on the other hand – having just a glimpse of O’Malley’s work one is anxious to know, who stands behind it. 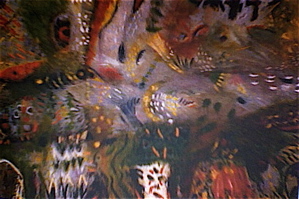 There is something about a natural symbiosis between this artist’s existence, various periods of his life and his work. We all know painters whose work doesn’t necessary reflect their private, ‘civil’ life; but Tony O’Malley allows his work to be, in a sense, an autobiographical, visual diary. So, one can sense his difficult beginnings in his early ‘darker’ period when he had to fight for a right to be the way, he chose to be. Committed to a dull occupation, after life-threatening operations and with no shadow of understanding of his artistic ambitions on the Irish province of the 50s. Then comes a period of an identity struggle when, being accepted by the community of some talented English painters (Patrick Heron, Peter Lanyon) he’s got a transitional stage of finding his true voice. The marriage in 1973 seemed to commence a ‘golden period’, again – to the same level in his life and in his work. He virtually explodes with creativity, vitality and shine and so do the dozens of gorgeous paintings of the last decades of his life. He calls them ‘paradises’, ‘dreams’, ‘songs’, they adopt startling exotic palette (this due to the Bahamas visits) and dancing, wonderfully fluid and free compositions made out of imaginative and abstracted elements. He is the painter of flowers, fields and birds – ‘epitomes of nature”, an owl – ‘the guardian spirit’ is his favourite one. The painter of his own intimate, extremely deep – almost mystical relationship with the Earth and its energies. Yet, at the same time he does walk the ground with the wide-opened eyes and a clear, wise, thoroughly modern mind; he would draw hundreds of quick sketches from life each day, even each hour (according to eye-witnesses) capturing light, shape, movement. His talent as a colourist is especially admirable, no matter how low-key, chromatically speaking, scheme he applies, how textured his boards and canvases, oils, acrylics are – the colour glows invariably as from the depths of its pigment and not merely from the surface. Those reproductions are of a rather average quality (and there is a great shortage of the images on the net), to really appreciate O’Malley’s work try to find a proper book, catalogue. Enjoy.